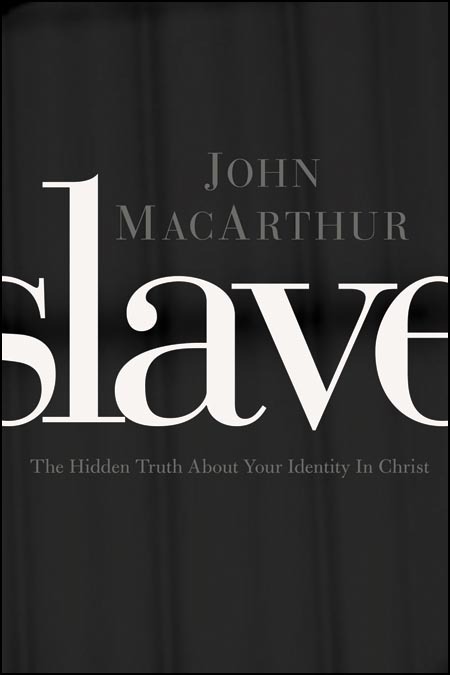 Last night Tony Miano of Living Waters posted an excellent review of John MacAthur’s new book titled, Slave – The Hidden Truth About Your Identity in Christ. As I’m waiting for my free copy in the mail at the first of the year, Tony’s review has stirred me with great anticipation. I trust the Lord will be glorified with MacArthur’s efforts to edify the Body of Christ and illuminate each believer’s rightful place as a slave to Christ. I have been a student of John MacArthur for almost twenty years. I’ve sat in the pew at his church and attended conferences to listen to him teach. I attended his seminary for a time. I’ve listened to him on the radio, and I’ve read many of his books. The first of MacArthur’s books that I read was the first edition of “The Gospel According to Jesus.” Again, that was almost twenty years ago. The Lord used this book to introduce me to the Doctrines of Grace–precious, biblical doctrines that have impacted every aspect of my life and my walk with Christ–from Bible study, to prayer, to handling life’s trials, to evangelism. Next to the Bible, “The Gospel According to Jesus” has probably impacted my life more than any other book I have ever read. John MacArthur’s latest literary offering, “Slave,” will, in all likelihood, send the same kind of theological shock-wave throughout modern evangelicalism that “The Gospel According To Jesus” did more than twenty years ago. “The Gospel According To Jesus” upset the then evangelical status quo of inviting people to “accept Jesus” and encouraging them to “just come as you are” without submitting to Christ as Lord by asserting that unless you submit to the lordship of Christ, He is not and cannot be your Savior. While many within the Body of Christ found “The Gospel According To Jesus” to be both edifying and liberating, others went on the attack–assaulting what came to be known as “Lordship Salvation.” The attack against the lordship of Jesus Christ continues today through the dead and dying “seeker” and “emergent” church movements. Whereas “The Gospel According To Jesus” focused on Christ’s rightful place in the life of the believer, “Slave” focuses on the Christian’s rightful place in relation to his or her King. And while “The Gospel According To The Apostles” was written as a sequel to “The Gospel According To Jesus,” “Slave” also fits nicely as a sequel to the modern-day classic. The book begins with a brief history lesson, which explains why translations as old as the King James Version and Geneva Bible improperly render the word doulos as “servant.” Although MacArthur does use the word “conspiracy” in relation to this discussion, he wastes no time delving into conspiratorial speculation. Nor does he attack the integrity of Bible translators, past or present. And, needless to say, there is nothing in the book that would leave any reasonable person–Christian or non-Christian–questioning the validity of the good Bible translations from today and antiquity, or questioning the infallibility or inerrancy of the Word of God. Pastor MacArthur simply lays out the facts, focusing on both ancient and modern social mores and linguistic changes (i.e. Greek to Latin to English) over time that may have influenced translators regarding the word doulos. What follows in the book is literally page after page of solid biblical study, which shows just how prevalent the Master/Slave paradigm is throughout the Scriptures–Old Testament, New Testament, the teachings of Jesus, and the teachings of the apostles. As he does so, Pastor MacArthur beautifully and biblically shows how important the Doctrines of Grace are to a proper understanding of the Master/Slave paradigm; and how a misunderstanding of these biblical doctrines can cause believers to misunderstand this all-important paradigm. In Christ, we are no longer children of wrath and disobedience but are instead children of righteousness, submitting ourselves to our heavenly Father, whose holy character we are called and empowered to imitate. Through Christ we have been set free. We are no longer slaves to sin, to the fear of death, or to the condemnation of the law. But we have been made slaves of God, for Christ, to righteousness. Such is true freedom. Thus, we are simultaneously sons and slaves. The two realities are not mutually exclusive–even if the metaphors are different. Forever we will be part of His family. Forever we will be in His glorious servitude (Rev. 22:3). As is the case with all of John MacArthur’s books, the Gospel of Jesus Christ takes center stage in “Slave.” While the primary audience for this book is the Christian community, this is a book I would put into the hands of unbelievers as well. While the provocative title and subject matter may draw the unbeliever’s attention, the presence of the Law and the Gospel throughout the book can and will, I believe, be used by the Lord to draw the unbeliever to repentance and faith in the Lord Jesus Christ. How often have I heard the angry argument that “the Bible teaches and condones slavery” from unbelievers who are merely trying to justify their unbelief, using their misunderstanding of Scripture to support their errant claims about the validity of the Bible and the Christian faith. “Slave” thoroughly answers this objection by showing the historical differences between First Century slavery and the slavery of Eighteenth and Nineteenth Century America that is so rightly loathed by reasonable and caring people–Christians and non-Christians alike. The only question is whether or not unbelievers who put their intellectual eggs into such flimsy baskets woven with objections like the “slavery argument” will have the intellectual integrity and courage to give the book an honest reading. One can hope. How often do you read the footnotes in a book? Well, if you tend to overlook footnotes, you will not want to do that when reading “Slave.” The research compiled in this book, both biblical and extra-biblical, is outstanding. And the footnotes provide not only supplementary data, but a treasure chest of information that enhances the reading experience. While more than 200 pages in length, I read “Slave” in less than thirty hours (which included Christmas Day and all of the associated activities). While scholarly to say the least, it proved to be a very readable volume for the layperson. But beyond the book’s readability, “Slave” is one of those books you will not want to put down. It was a joy to read. I was both educated and edified as a result of reading this book. I highly recommend “Slave” to any Christian who wants to grow in his or her faith and who wants to further establish a right understanding of the Christian’s relationship to his or her Master. I believe “Slave” could very well take its place alongside “The Gospel According To Jesus” as one of the most important works John MacArthur has ever written. Assuming the Lord tarries, I believe its impact upon the Body of Christ will be felt for many years to come. God's Light Must Shine in Us. First.